I’ve never made my own home made liquid laundry detergent but, have always wanted to. I suppose I thought it involved a lot of steps and mess and just didn’t feel like tackling it, Until today! And the only reason I even attempted to make home made liquid laundry detergent today, was because I found this awesome ingredients list and instructions that make it a whole lot easier than I ever thought it could be. Laundry detergent is one of the most toxic, chemically laden products in our homes. The Think Dirty app lists most of them as 8 or 9 on their toxic ratings. Sodium Borate (also known as Borax) – Respiratory and sin irritation. Alcohol Ethoxy Sulfate – skin irritation. Diethylene Glycol – pregnant women use with precaution. this is restricted for use in cosmetics in Canada and completely banned in other countries. * a note here to say this ingredient is in Tide!! Did you know that? I sure didn’t!! The last store bought detergent I had been using had over 30 ingredients!! With other leading brands having as many as 45 different ingredients!!!! Now let’s look at the ingredients I’m using to make my home made liquid laundry detergent. And that’s it! Now, not only do I know what is in my home made laundry detergent, but It’s so easy to mix together!! Help With Dinner Time For Back To School Days! Summer went by soooo quickly this year! It’s so crazy that it’s September already! I know a lot of kids are back to school already, I’m avoiding it a little bit longer over here. 😉 But, the schedules are already filling up for fall time! Most of us are looking for help with dinner time for these back to school days. And these are the crazy days I’m so thankful to have dinner packed away in the freezer. I mean seriously, with piano lessons and Lego class (my guy is super excited about that one), homeschooling, and chasing around our 1-year-old. Rushing us all off to Awana classes and MomStrong Bible Study… The last thing I can do is spend loads of time prepping and cooking dinner every single night!!! So, in case dinner time is crazy for you too, I thought I’d share how we use our membership with Once A Month Meals to help! Today I am excited to share with you another family favorite recipe! 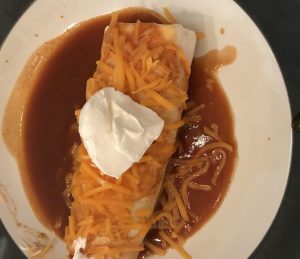 Smothered Beef Burritos now converted to the Instant Pot! I’ve been really trying to convert some of our old crock pot recipes to be prepared in the Instant Pot. We have a lot of crock pot recipes, I use to grab my crock pot 2-3 times a week. and Now thanks to the Instant Pot I haven’t touched a crock pot in about a year and a half! So, we have really been missing this Smothered Beef burritos recipe and I’m so excited that it is now ready in under 30 minutes instead of 4-6 hours!!! How do you prepare for the New Year? I thought I’d share some of my favorite ways I get my planner, household binder ready for the New Year since 2018 is coming up quick! I know EVERYTHING is turning to technology and it really is amazing. We use a calendar app on our phones that links my husband and I together, which is so helpful when we aren’t at home. But I am still very old school when it comes to how much I LOVE binders and to do lists and such. I’ve had a master house hold binder for a few years and every year it changes a bit. You really want to personalize it the way you need it to work for you. And those needs change as your family grows and changes. A couple years ago I had a section dedicated to pre-school and what I wanted to accomplish with the boys. That isn’t really necessary now that we are in a charter school and it is all kept either online or included in our curriculum. There are lot of beautiful planners out there, ready-made and some customization if you are wanting to just order something. But building my own with printables here at home has really worked for me! You really need to think about what you want to use your binder for.. what are some of the goals you want it to help you reach… and what areas do you need to stay organized in? 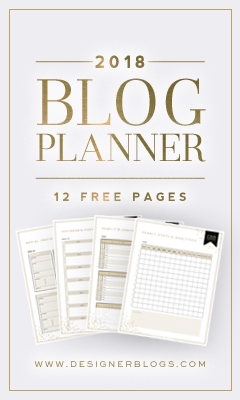 Designerblogs.com is seriously the best of both worlds in that you can get a complete and pretty extensive planner BUT you still print at home for the best customization possible, you only print what you want to use, so you aren’t left with a binder that doesn’t work for you! Isn’t that great? and just look at how beautiful these pages are??!!! 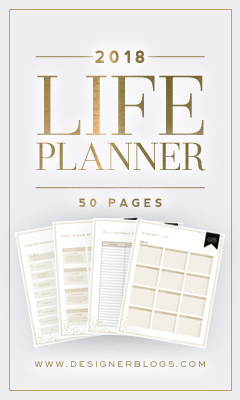 Check out all the pages included in the Ultimate Life Planner! This really has everything and more that I’m looking for in a planner. I would have never thought about tracking things like my workouts in a designated area.. how motivating will it be to see it all filling up!??! First thing in my binder is always the monthly calendar pages! I find that even though I have a calendar updated on my phone all the time.. it is nice to just see a whole month in front of me! There’s also some weekly reminder pages, to do lists.. etc. Usually every year I will print a couple of something new like a to do list or weekly schedule or something and give it a test run before I print very many of them. This year I’m adding a blog planner section to my binder ( I tried a seperate binder last year but I think it will work better to have it all in one) I am really trying to make 2018 be a great year for Loveandscribbles and I know I need to be more organized and scheduled. I love how the pages on designblogs.com fit right in with the Life Planner! Blank Yearly Stats & Analytics – new! Weekly Facebook Post Planner – new! Weekly Instagram Post Planner – new! Pinterest Post Planner – new! Email Campaign Tracker – new! Automated Email Planner – new! Email Campaign Planner – new! Binders, printables, and accessories are the simple things that help me feel like I can tackle the New Year! And in complete nerd fashion.. Office supplies are some of my favorite things! It’s funny how a nice pen or pretty binder can motivate me to stay organzed or at least try! If you are still with me in this long blog post, thanks for sticking around! I hope some of these ideas and resources can be helpful for you as you head into 2018! Remember I said there was one more thing that I hoped to share about coming into the New Year. I love to journal and I really love looking back at what we were doing on any given day a year, two, or even three years ago. One thing I’ve found to be super fun and motivating is to list our goals of the new year.. Both individually for each of us and as a whole family! I just found last years and really enjoyed looking at how much of the list we had actually accomplished. Sometimes indivually goals are pretty practical (coming of age) sort of things. Like a boy needs to be potty trained or we need to say goodbye to pacifiers or something similar. I also like to try to think of fun goals too.. like maybe investing in an interest that we’ve noticed etc. Writing it all down on one sheet of paper, can really be fun to look at throughout the year to remind yourself of the big pictures. And if your kids are old enough you could even set these goals during a family meeting! And don’t worry if 2018 has already started when you are reading this.. It’s not to late to have a great year! An alternative to those sugar and preservative filled bars my boys live. Combine all ingredients together in a mixing bowl. Add more honey if needed. Line your pan with parchment paper. You can use an 8×8 pan or a sheet tray with an edge if you want thinner ones. Another option is to just roll them in balls. Place in freezer until solid, about an hour. Once frozen cut into bars. wrap each one with parchment paper to keep from sticking together. Store in the fridge or the freezer. Place frozen pineapple chunks in the food processor and blend with the milk. scrape down the sides and add more milk if it isn't creamy enough. Taste and add honey if the Pineapple isn't sweet enough on it's own! Enjoy! 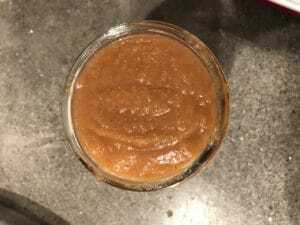 Instant Pot Applesauce, Easy and Delicious! 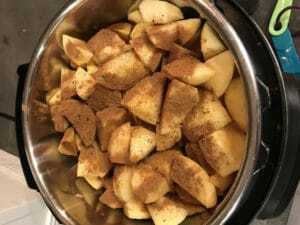 Applesauce in the Instant Pot! 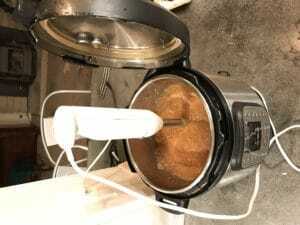 Applesauce could not be easier using the Instant Pot and it is soooo delicious! First off we are blessed to live close to a lot of great Apple Orchards. The Apple Hill Growers are an annual family outing for us. And we always bring home our favorites, This year we grabbed Apple pie (to be baked later), Apple Cider, and a box of apples! I started by peeling all of the apples. If you don’t mind the skin you should totally skip this step!! This step was definitely the most work, but since my little guy will be eating it I decided it was necessary! Then just a quick ruff chop and throw them in the pot! Applesauce is awesome because you can really add any flavors, seasonings you want to. Want to pack in as much health benefits as possible? Here’s some easy ideas. Local Honey (great for seasonal allergies) ** Not appropriate for little guys under a year though. place lid on and seal. Set on Manual for 3 minutes! The Pot will come to pressure then cook for 3 minutes. Let it natural release completely. Turn off the pot, so it doesn’t stay on keep warm. (depending on how many apples you do at a time, this will take about 15-20 minutes) Walk away and let it cool off. Then my other favorite kitchen appliance comes in super handy. If you have an immersion blender you can blend the apples up right in the pot! They aren’t very expensive so grab one on amazon before you make your first batch of applesauce. You can store your applesauce however you want. Usually I put some in a mason jar for my bigger guys. Happy Instant Pot to you all! My favorite fall home made snack or side! Applesauce is just a cozy delicious treat and it's easier than ever in the Instant Pot. Peal apples (if desired) and chop. 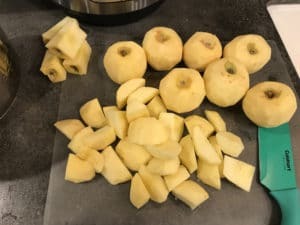 Place apples, water, and seasoning in the Instant pot. Seal lid and set on Manual (High Pressure) 3 minutes. And that's it! Blend until as smooth as you like it. The immersion blender is awesome for this. But if you don't have one you can transfer the apples to a blender and blend that way. Be careful if the apples are still hot. 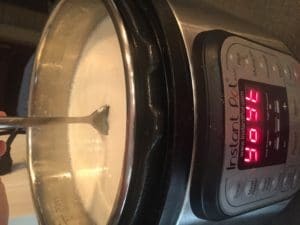 Seriously Easy Instant Pot Greek Yogurt! I am so excited about Instant Pot YOGURT!!! through our blog we will be compensated at no extra cost to you! Thanks! Let me just pause right here and say, I never really expected to get into this kind of “everything” home-made kind of home making… and this project intimidated me a lot! but now that I’ve made it once, and wrote down some notes for next time, I am so beyond excited! It is pretty fun to provide home-made goodies for my family, and it’s especially nice when you can find recipes and methods that have already been ironed out! I wouldn’t have even attempted to make yogurt if it wasn’t for my amazing Instant Pot! Man, I love this thing! Best Christmas present ever! (Thanks Babe!) From applesauce, to a freezer full of dinners, making my lunches a breeze and now even making yogurt… The Instant Pot has been (dare I say it?) life-changing! If you aren’t familiar with this miracle appliance ? You can read my previous posts about it here. I was nervous to take on yogurt. So, I’ve been looking into it for a while now and preparing myself for the task.